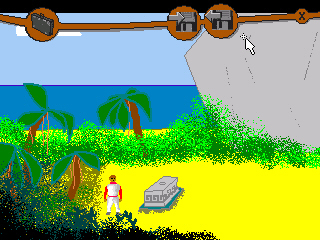 Adventure Game Studio | Forums | "The Draft Drifter Who Dashed Doctor Dunno" - Back Online! Topic: "The Draft Drifter Who Dashed Doctor Dunno" - Back Online! I too got stuck to the pole code but after downloading the fixed version I finished the game. And I liked it. Waiting for part 2. Regarding part 2: as I said we already have the story done (and yes, this time it's a real story ). However, the whole thing is bigger than part 1. We have 2 playable characters, many many more backgrounds ... much more animation. Right now I am forcing my team to make a complete storyboard first so that we have a clear idea of the puzzles, the backgrounds we need and all that. I'm glad you liked the game. Just gotta say...LOVED your game. I loved the music in the cut scenes... so fitting. Really cute, fun little game. Hi everybody. Thanks for playing the game! Really, the whole team appreciates it! I just had a look into the skript and figured out that there really is a bug with the numbers at the pole. Because of people like Sztyopek (no offense) we skripted so that you can't just go to the pole for the first time and just work through every single combination ... find the correct one ... and finish the game without ever visiting the bar. You need to have the note from the professor in order for the correct code (which is generated randomly at the start of every new game) to work. To solve the bug you will need to load a previous save game (if you don't have one you can download it right here) and interact with the knocked down professor only once ... type in the numbers at the pole ... push the round green button ... and you should be able to finish the game. You can also download version 1.1 of the game which fixes another minor things as well right here. I really hope this bug didn't ruin you gameplay. If you are interested in a game with profound characters, logical storyline, stunning visuals, and a download size below 15 MB ... then this game is not for you. Germany in the year 2002. Young men who turn 18 have to decide whether to attend the German Army for 10 months or do community service instead. During the day these community workers help disabled persons, attend children in kindergarten or work as janitors. However ... at night ...they show their true colours. They are the best kept secret of the German Secret Service. They are fighting against crime and terror all around the world. You play Agent Roger who has just been ordered to fly to a forsaken Caribbean island and find out whether or not a strange professor known as "Doctor Dunno" has kidnapped a renowned archaeologist. This is part one of a two part game. -A mysterious Caribbean island and its strange inhabitants (like Kurt, an eccentric showmaster who broadcasts his "Who Want's To Be a Millionair"-like quiz show to non-existent viewers. -two Easter Eggs and much more! 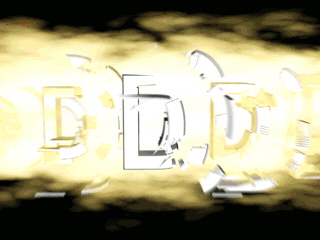 A picture from the action intro sequence: the 5 "D"s of the title logo blasting apart. An altar deep in the jungle. Will Roger be able to turn this shabby bar into a disco dance palace? And then - does he really have to? For more screeshots look here. Fixes Bug where you could skip the quiz beach scene and not get the mattock. Fixed Bug with Magnet-O-Security not accepting the correct code. The stone seller will stay longer at the beach so it is easier to solve the puzzle. You can now open AND close the inventory system with the TAB key. And a few other small things. Yes, it is 16 MB but its a fast server with loads of bandwidth and no downtimes! Please read the Readme file before you start playing. There are some things in the interface which differ from the standard AGS game. Have fun and feel free to post any comments! As you play the game you will find that most but not all music and graphics were done by me. I own legal copies of all this stuff. However, if you have any problems with me using these things feel free to send me a PM. FANTASTIC GAME. GREAT MUSIC, ARTWORK, STORY, EVERYTHING. REALLY ENJOYED PLAYING IT AND LOOK FORWARD TO MORE FROM YOU...... BRAVO ....TAKE A BOW!!!! Thank you very much for your nice comment! This is better than we had hoped for! It really encourages to work even harder on part two! The link don't works anymore ?? There is a problem with our server at the moment. We are working hard to fix it. The download should be up again, soon! I'll notify you as soon as is available again. 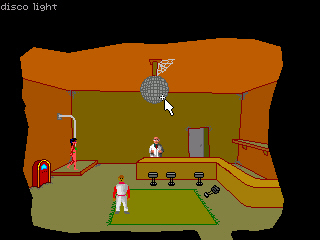 I just wanted to say that while there are a few problems with the game [mostly knowing where one can walk off the sides of the screen] I loved this game, it was funny and had a lot of style. Finished the game. It was much better than I anticipated from looking at the screenshots. The strongest point in this game was the dialog. It held the most humor, and the most enjoyment. Second to that, were the well made cutscenes. The puzzles were okay, the one with the plank was probably the most ingenious. The only problem have already been mentioned, and I downloaded the more buggy version, so I'm not about to complain about what you may have fixed. It was a fun game. Congradulations. Re: "The Draft Drifter Who Dashed Doctor Dunno" - Back Online! We really intended to put more (game) graphics in the intro. However, it turned out to be too complitated and the text fittet the music perfectly. We will keep the problem with walking off edges in mind for part two! We are really glad that you tell us how you felt about the dialog in the game. We are from Germany and did the whole game in German, first. It was a really hard job to translate all this stuff into English afterwards. Because it should sound like common English and not like German translated into English. And then we had to translate the jokes (which was the most difficult thing). However, the quiz beach scene was the most funniest to translate because we wanted Kurt to really talk incorrect English. I'm really pround of my translators and proof readers. The did a great job! Why do you have to remove the plank to fall into the water, why not just jump? There's no logical reason for why you can't leave the telescope at the top of the cliff while fetching the plank. Why does the girl need to drink the milk, when you could empty the glass anywhere to find the coin? I did find a bug though, where you could have one plank in your inventory while another was still lying across the stream, thus allowing you to use the telescope without visiting the quiz master. I wasn't able to pinpoint the exact cause, but I think it involved picking up the telescope while having the plank in your inventory, but I'm not sure. Overall, great writing, wonderful use of music and great comedic timing. Thanks for your feedback, GarageGothic! You're, the puzzles can be annoying. I think that is because we didn't think of them before starting with the creation of the game. We drew the first background and placed Roger in it. After a few backgrounds were created we tried to think of ways how to implement puzzles into them. One of my beta testers mentioned this problem as well. However I'm still unable to figure out what it is. The script looks fine to me. Can you help me because I'm really stuck on this? I poured some of the sulpur and nitre into the half of the coconut. I want to attach the fuse to it because if I try to use it alone he says its not enough power. The problem is when I try to use the glue wilth the fuse or the glue with the coconut he says, "glue is not useful here." This puzzles me. I think you're just missing a small detail. After sulphur and nitre are in the coconut you have to wrap the ROPE (not the fuze but the rest of the plain liana) around the coconut. Then you can stick the fuze to it and finally apply a bit of glue on top. btw. I was on Maui once and I really loved it! So beautiful. Please let me know how you liked the game, when you're finished! Wow, that was the most fun I've had with completely random puzzles in a long time. Just when the artwork hits a new low, you redeem it with something like the disco sequence. This game certainly keeps you on your toes. May I suggest some more in-game hints for the puzzles? Some text on the altar to explain why to pour the milk in the hole. I don't know how anyone would ever think to pick up the plank when standing on it. Why not just jump in the water in the first place? Ingenious? No. Ridiculous? Mmm. Really, this game would be much more entertaining if it was much less frustrating. I had to look up the solutions to nearly everything in this thread. Laugh out loud funny at times. We'll definitely follow your suggestions about making the puzzles less frustrating in part II !! Perhaps we should put a walkthrough into the zip-file. I'm an editor of a freeware section in a czech paper magazine about computer games, Level. Level is the best-selling gaming mag in the Czech republic, you can find more info about it at www.Level.cz. I'd like to ask you, if you'd agree with publishing your currently released game - winner of the ATC - on our cover CD and/or DVD in the May issue of Level. Is it possible? Well I don't know if this is serious or a joke (I don't know Czech so I can't read the homepage of that magazine). I'm also a bit concerned about the music in our game. As I said, I own legal copies of all the songs, but I still don't know if it's legal to distribute the game via a magazine (which one has to pay for). And last but not least I don't know what "winner of the ATC" means ... was there some kind of contest I don't know about?